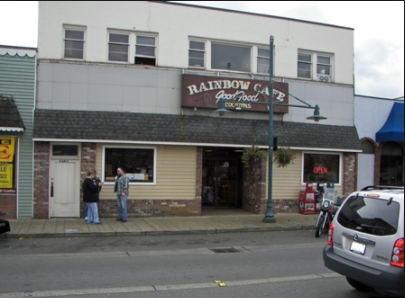 Monday, October 2, 2017, I have been invited to read for the Striped Water Poets in Auburn, Washington at the Rainbow Cafe, 7pm, 112 E. Main Street. 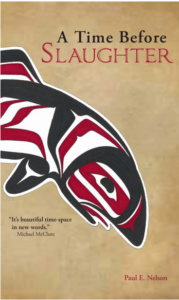 Bill Yake will also read and it will be my second reading in Auburn since I left in August 2009 after living there for 17 years, 6 months and 2 days and publishing the book “A Time Before Slaughter” chock full of Auburn history. I look forward to seeing old friends and reading a poem for my late friend Brian Love. Thursday, October 5, 2017, 8pm at Flying M Coffee Garage, 1314 2nd St S. in Nampa, ID. 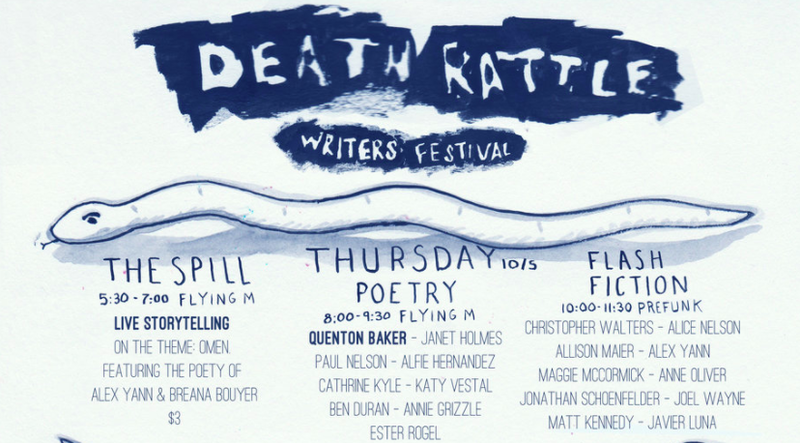 I’ll be one of the featured readers the opening night of the Death Rattle Writer’s Festival. Quenton Baker and Janet Holmes are also featured, among others, and I look forward to meeting them and hearing their work. Good to be getting to know some poets in Eastern Cascadia. Monday, October 9, 2017, 7pm, at the Mt. 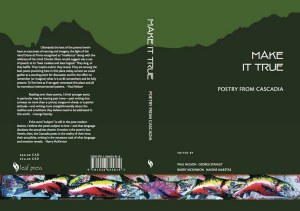 Baker Theater, 104 N Commercial St, Bellingham, WA, I’ll be on a Poetry Postcard Panel, with Tallie Jones, Ina Roy, Nancy Pagh, Joanna Thomas and Eugenia Hepworth Petty. 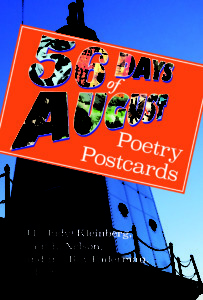 Judy Kleinberg, one of the editors of the 56 Days of August poetry postcard anthology has arranged all this and I’m delighted that Ina, the other editor (the main one truth be told) is coming up from the Bay Area to be part of this. Thursday, October 12, 2017, 7pm, at King’s Books, 218 St Helens Ave Tacoma, WA, we have the launch of 56 Days of August as the first event in the Cascadia Poetry Festival. Ina Roy, Judy Kleinberg and hopefully MANY OTHER postcard poets will be reading that evening. Admission is free, but we would encourage you to stay in Tacoma all weekend and get a gold pass for the most ambitious poetry event I have ever attempted, with the support of Dale King, the Puget Sound Poetry Connection, the SPLAB Board, key volunteers and many other poetry lovers. 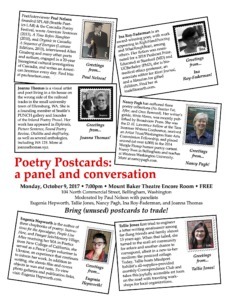 October 13-15, 2017, at the Washington State History Museum, 1911 Pacific Ave, Tacoma, WA, I will be enjoying Main Stage readings, a tribute to Tacoma Native Richard Brautigan featuring his daughter Ianthe, CA Conrad, WA Poet Laureate Tod Marshall, Nadine Maestas, a panel on War Poetry/Veterans, featuring Abby Murray, Philip Red Eagle, Bruce Weigl, Doug Johnson, Gary Copeland Lilley & others, as well as Lorna Dee Cervantes, Patricia Smith and one of my poetry heroes, Michael McClure, who reads 5 days before his 85th birthday, Sunday, Oct 15 at 6pm. There are workshops and it all costs $25 yankee dollars for a Gold Pass. 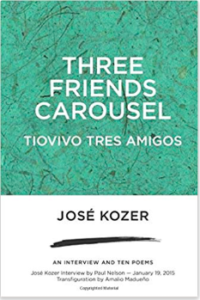 Get one HERE. 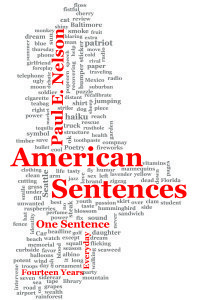 This entry was posted in Uncategorized and tagged 56 days of August, Abby Murray, Bill Yake, Bruce Weigl, CA Conrad, Dale King, Death Rattle, Death Rattle Writer's Festival. 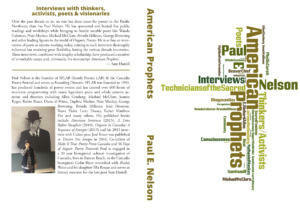 Quenton Baker, Doug Johnson, Gary Copeland Lilley, Ianthe Brautigan-Swensen, Ina Roy, Janet Holmes, Joanna Thomas and Eugenia Hepworth Petty, Judy Kleinberg, Lorna Dee Cervantes, Michael McClure, Nadine Maestas, Nancy Pagh, Patricia Smith, Philip Red Eagle, Puget Sound Poetry Connection, Richard Brautigan, Tallie Jones, WA Poet Laureate Tod Marshall. Bookmark the permalink.